Dawson's Russian Oxheart AKA Orange Russian 117. Cross of Georgia Streak and Russian 117 by Jeff Dawson. 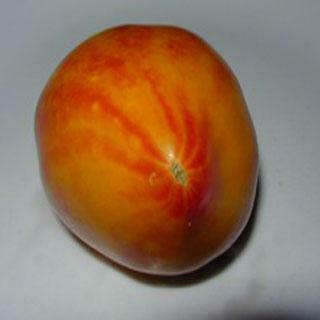 The solid yellow flesh with swirls of raspberry is aromatic, sweet and lucious. Heirloom Seed Packet. Dawson's Russian Oxheart A. K. A. Orange Russian 117. Cross of Georgia Streak and Russian 117 by Jeff Dawson. My number two favorite in summer of 2010, after Mrs. Benson. Good friend Pat Kennedy, gardening guru, sent me the seeds for this variety and raved about it as though she had hit the mother lode. Exaggerating she wasn't. Dawson's is an absolutely beautiful , huge bi-color oxheart tomato. They hang on the vines like brilliant gems dancing in the sunlight. When you bring one in, slice into it and taste it, you realize you have found a gem! This is the kind of tomato we all dream of during the longed for months of Summer. The solid yellow flesh with swirls of raspberry is aromatic, sweet and lucious. The first fruits are very large, but become smaller throughout the season. Long lasting plants will keep you happy.